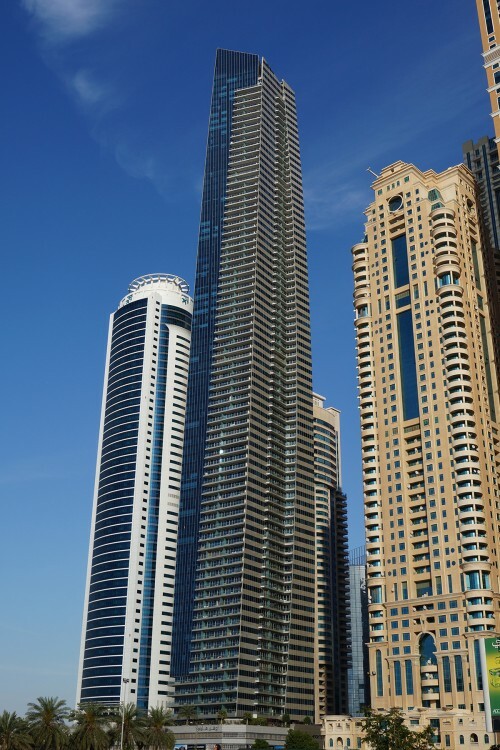 Ocean Heights is a supertall residential skyscraper in Dubai Marina developed by DAMAC and designed by Andrew Bromberg of Aedas. 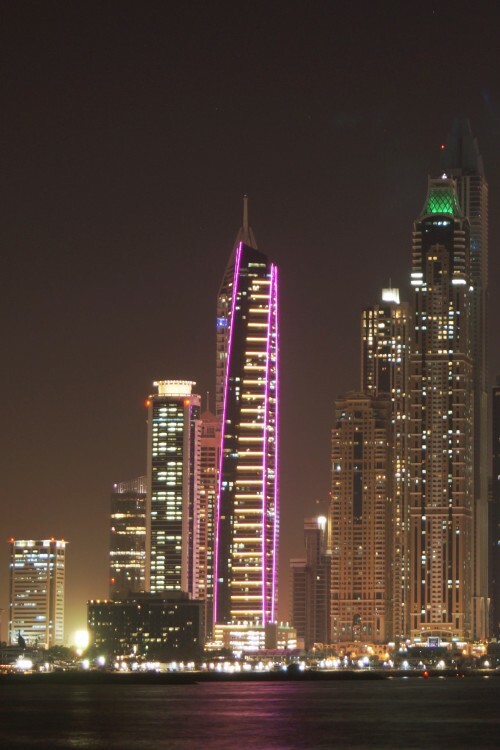 The tower stands 310m (1,017ft) tall and has 83 floors and contains more than 519 apartments. When ground works and piling began on site Ocean Heights was to have been a 50-storey building . But when the developer saw taller buildings receiving planning permission in the Marina they began to think taller. 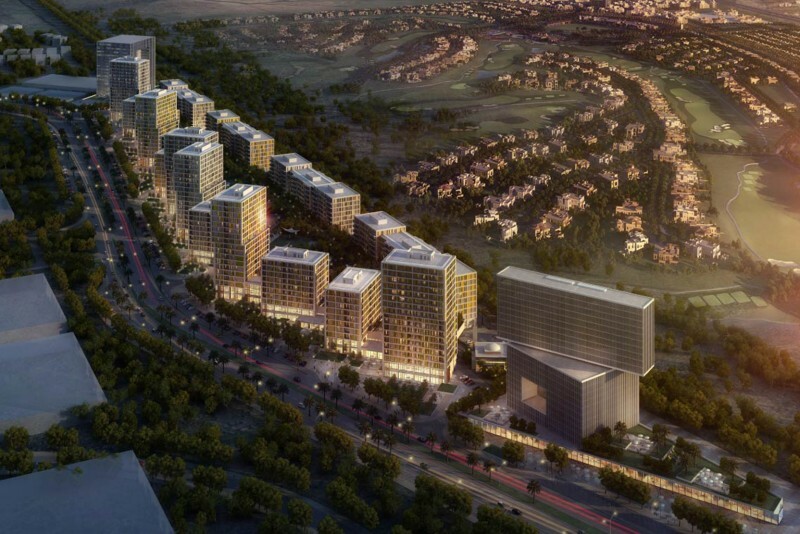 DAMAC gave the architect two weeks to produce a 72-floor, 60,000-sq m tower design. 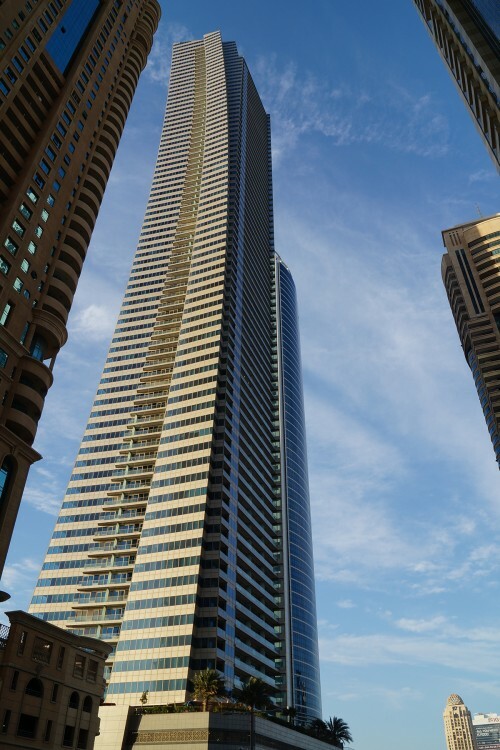 Then they said they wanted an 82-floor building rising to 310 metres high, and wanted its design completed in a week because they had already sold apartments off plan. The architect says, “We had to stick with the original sketch design because that is what the developers were selling from and the same foundations because they has started digging. 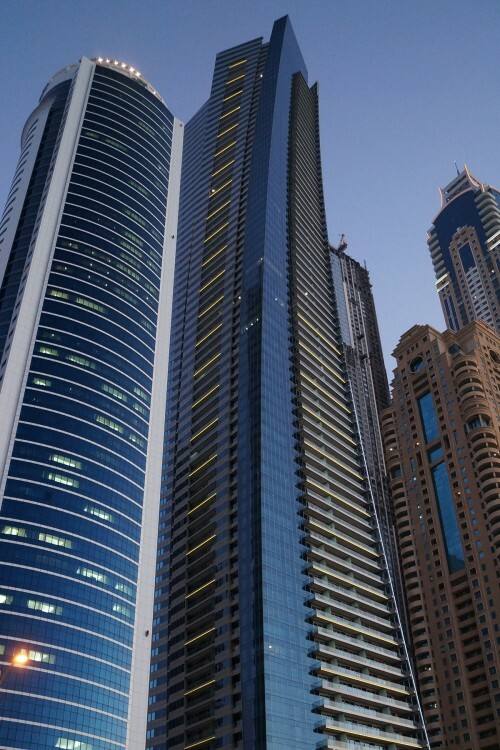 The only thing which could change was the building's height with all the implications of massively increased loadings and extensions to lifts and stairs and services. Fortunately that all turned out to be possible. And we got to understand that everything in Dubai is pre-sold. “The building's apartment layouts are designed to a system of standard four-metre wide modules. Their sides stack up all the way down the building with only the front part of the module changing to produce the exterior twist. This simplified the structural system and reduced the amount of construction materials. “The tower’s front elevation that faces the ocean is clad in glass … [which] comes as insulated panels with a low E-coating that provides shading from the sun. Both insulation and coating reduce the need for mechanical cooling and allow natural daylighting. 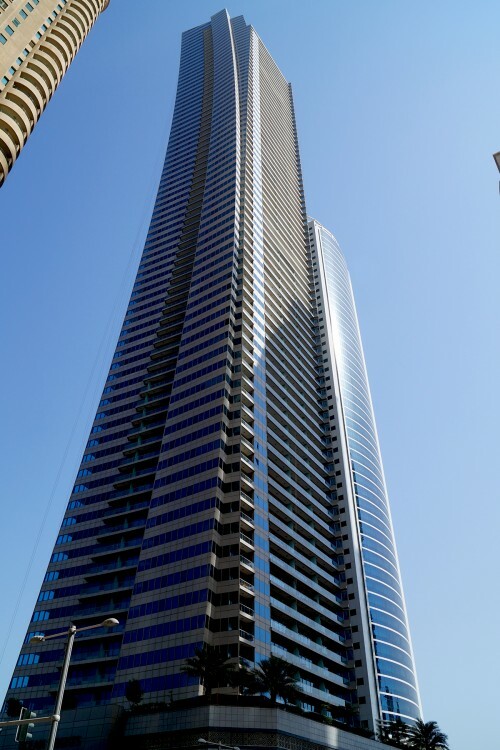 The building was topped out on 22 December 2009, and completed for handover at the end of 2010. One-click links to properties currently on the market in Ocean Heights. Ocean Heights reveives an overall rating of 3.5 based on 10 reviews. Users were asked to consider many factors including the view, finishing, layout, noise levels, traffic, public transportation, parking, security, swimming pool, gym, and maintennance. I currently live in a 2 bedroom flat above the 40th floor. The value for money is pretty good here in comparison to other buildings in the Marina. The pool and gym are great and the apartments are spacious. Security and maintenance are also great. 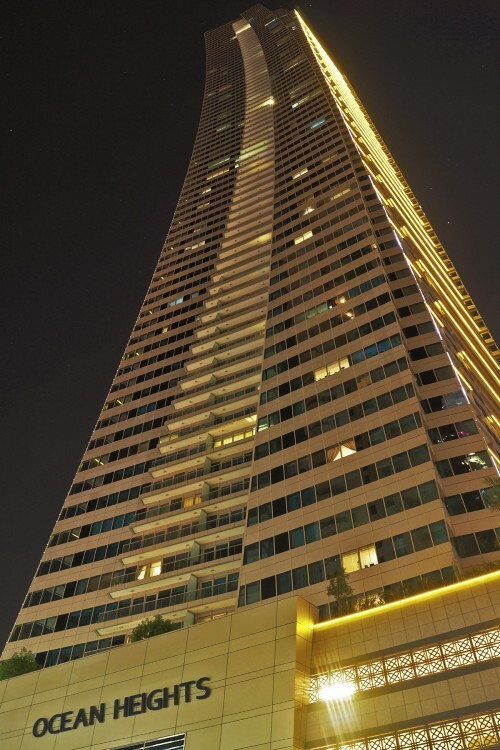 The building is among the best I have ever lived at in Dubai. But I am paying a lot to have a full sea view for a one bedroom. Security is very high at the building, very helpful for residents, you really feel safe. I keep my doors unlocked often. The building is very big and amazing: good quality and maintenance, very big swimming pool where your children can play and enjoy. It is near the Marina walk. The main problem we had was the noise level (construction of other buildings and new tram). Our appartment is quite large, although the bathrooms are really small. The finishing is reasonable, but could be better. The best thing of our apartment is the huge balcony with sea view. Pool and gym are very good. Definitely a good place to live!